Rather than drive people away from television, the Web has given viewers a larger water cooler around which to discuss it. Networks have taken notice and the savvier ones are taking advantage. HBO’s handling of online marketing for “Game of Thrones” is the gold standard in social media management for a television show. It’s not just the breadth of its online presence, but also the depth — viewers who like the show’s Facebook page (and 2.6 million people have), for example, get regular access to behind-the-scenes features, photos, posters, quizzes, wallpapers and interviews. The show’s GetGlue profile is also extremely popular; check-ins for its season premiere were enough to disrupt the site’s service. It’s sailed past a million check-ins, and fans who love the show can earn stickers for watching not just the episodes, but also the various trailers that led up to the show’s premiere. And of course, what self-respecting television show these days is without its own YouTube channel? “Game” has a YouTube presence loaded with content: recaps, interviews, features, maps, previews and more. The cross-promotion between Facebook, YouTube, GetGlue and Twitter (followers: 316K+) is nearly flawless. GetGlue check-ins show up on the Facebook feed; YouTube videos are promoted on Twitter. The cohesion of the social media strategy is very impressive, in terms of visual style and voice. But surely any show with a clutch marketing team can make that sort of thing happen, right? Which leads to HBO’s ace up its sleeve: “Game of Thrones” knows who its fans are, respects them and gives them a role in the marketing. An entire playlist on the YouTube channel is devoted to fan-submitted covers of the show’s gorgeous theme. My personal favorite is Jason Yang’s violin cover, which has racked up more than 2 million views. The guy who runs the show’s Twitter account says that he’s a fan of “A Song of Ice and Fire” in the bio, and his tweets demonstrate a love and appreciation of the source material beyond mere content-shoveling. He finds ways to appeal to both newer fans, those who just watch the show, and older fans, whose knowledge of the story goes beyond “Game of Thrones” and extends into the five books and their author, George R.R. Martin. Where some shows would ignore fan-submitted art entirely, “Game of Thrones” embraces it, regularly featuring fan-made drawings, paintings and even posters on its Facebook page. Notably, two fan-made posters — one featuring a reimagining of the Stark direwolf sigil, and another making great visual use of Sean Bean’s severed head — became integral parts of the show’s second-season marketing. One does get the impression that, if you’re a fan, the show really does want to hear from you. And that, in turn, only cements viewers’ loyalty to the show. It is known. Even though I’ve been familiar with the series for a while, it took the television show to get me to read the books. The fifth novel, the long-awaited (for longer-term fans, that is) “A Dance With Dragons,” comes out next week. I decided to try to read the first four before then. While the novels most definitely fall into “fantasy” territory — their entire world is fictional and includes magic and supernatural creatures — they stand out to me for two reasons. The first is their extreme realism, or as much realism as a fantasy series can get. They have a depth, a moral ambiguity and a complex social and cultural fabric that would be impressive in a mainstream fiction novel, let alone one in which virtually everything stems from the author’s imagination. The second reason I love them is that they contain what I like to think of as a dog whistle for British history enthusiasts. It’s completely possible to read and love the series without ever thinking about its real-world parallels, but I loved reading it and picking out its historical counterparts. Martin based the series at least in part on the Wars of the Roses, and you can plainly see our own world history in the story. Westeros, the continent on which most of the story unfolds, was originally settled by rural “children of the forest” and subsequently invaded by the First Men, Andals and the Targaryens. I interpreted these to be the Celts/Picts, Romans, Saxons and Normans, in that order. Like the Normans, the Targaryens came from an eastern landmass and brought their own language and culture. Like Aegon the Conquerer, William the Conquerer consolidated independent kingdoms and clans. The southern kingdom of Dorne, the last to join the Seven Kingdoms, reminds me somewhat of Wales. The brother-against-sister civil war in the series is a clear parallel to Matilda and Stephen in English history, and even had the same outcome (the brother defeated his sister, but her son succeeded to the throne). Like the long Plantagenet line, the Targaryens ruled for several hundred years. A dynastic shake-up in the series that occurred roughly two generations before the novel’s present could be a parallel to Henry IV overtaking Richard II. Robert Baratheon and his line appear to Yorkist, overthrowing their Lancaster/Targaryen cousins, and sending the surviving heirs into hiding/exile. By plotting her return to Westeros from across the Narrow Sea (i.e. the English Channel), Daenerys Targaryen reminds me of Henry VII. Henry VI suffered from a mental breakdown, and though he never became murderous, it is easy to identify him with Aerys II Targaryen, the murdered Mad King. Robert Baratheon is a clear Edward IV figure, a warrior-king who eventually fell into excess. His victories in the Trident, where he first won his crown, and against Balon Greyjoy’s rebellion remind me of Edward IV’s Towton and Tewkesbury. Robert’s queen, Cersei Lannister, and their son, the eventual king Joffrey, appear to be a composite of Margaret of Anjou and Edward of Lancaster (Edward VI’s wife and son), and Elizabeth Wydville and Edward V (Edward IV’s wife and son). Like Margaret, Cersei is the real power behind the throne and “scheming.” Like Elizabeth, she’s protective of her children and has to contend with outside interests when her son becomes king. Like Edward of Lancaster, Joffrey’s parentage is suspect and he has violent, cruel tendencies. Like Edward V, he succeeds his father as king at a young age. Robert’s brothers, Renly and Stannis, and Cersei’s, Tyrion and Jaime, display various aspects of Edward IV’s brothers, George and Richard. One is blamed for his nephew’s murder (Tyrion, like Richard) while two openly defy the line of succession (Renly and Stannis, like George and Richard). Another killed the previous king (Jaime, like George and Richard, allegedly). Tywin Lannister is akin to Warwick the Kingmaker, in that his immense wealth sustains the crown, and his loyalties shift based on expediency. Mace Tyrell, a powerful lord whose daughter weds three kings in succession (like the Neville girls wed kings and/or heirs to the throne), is also reminiscent of Warwick. The basic geography of Martin’s world is extremely similar to our own. Westeros is Britain on a larger scale, while Essos is the mega continent of Europe and Asia, and Southros is like Africa. The free cities of Essos are very similar to the duchies and city-states of Germany, France and Italy, while its eastern desert is like the Middle East and the mysterious Asshai is Asia (they even look/sound similar). Northern Westeros is divided from the south by an ancient wall (similar to Hadrian’s), and is home to tribal groups that southerners consider socially inferior — a nod to the Scots. Like England, the Seven Kingdoms also have a distinct north/south dichotomy in terms of wealth and culture. Finally, and perhaps most tragically, Ned Stark reminds me of William Hastings, Edward IV’s honorable friend who ended up on the wrong side after the king’s death and found himself short a head. I’m sure that other similarities exist, but those are the principal ones. Other characters in the series, such as the Stark children, do seem to be relatively independent of exact historical parallels, but the groundwork is there, plain as day. That just makes it more interesting and adds a different perspective to the reading. Note that I’m not sure that those exact parallels are the ones Martin had in mind; they’re just what came to me as I was reading. The series is long and grueling in places — the third book, though the best, is also a beast — but well worth the time and energy for a great story. I can’t wait until next week when I can pick up the fifth book. And yes, I’m a geek. If you have HBO and aren’t yet watching “The Pacific,” I highly recommend it. I watched “Band of Brothers” on HBO when it aired eight and a half years ago, right before the Sept. 11 attacks. I remember it feeling larger than life, sprawling and “important.” On the other hand, I also remember losing track of the characters and having a difficult time forging connections with many of them, just because of how many of them there were. “The Pacific” succeeds in that area where “Brothers” faltered. Rather than following an entire company, “The Pacific” focuses on three specific men: Robert Leckie, John Basilone and Eugene Sledge. That makes it feel much more intimate and personal. It’s easier to become engaged in and committed to the three men, who are all interesting and unique in their own ways. Speaking of film geekery, if Joe Mazzello looks vaguely familiar, it’s because he played little Timmy in “Jurassic Park” back in 1993. And for my fellow “Eurotrip” lovers (it’s one of my favorite guilty pleasures), try to spot Jacob Pitts, aka Cooper, among the Marines in Leckie’s company. The series is about halfway done. Guadalcanal, Melbourne, Cape Gloucester and Pavuvu are behind, while Peleliu, Iwo Jima, Okinawa and the endgame are ahead. Even knowing what happens, who lives and who dies, I’m eager to see how it unfolds. I make no secret of being a military history enthusiast, and WWII in particular. It’s something I can share with my dad — we’re watching the show together — and I believe it’s something people my age know appallingly little about. In the end, though, I don’t read and watch WWII material out of patriotism or duty or anything like that. At its heart, it’s a series of great stories that need to and deserve to be told. And I’m a sucker for good stories. “The Pacific” airs new episodes at 9 p.m. ET/8 p.m. CT Sundays on HBO. Older episodes are available on demand, and repeats air throughout the week. April 11 will be the show’s fifth episode of 10. Here’s the official trailer from HBO. If you’re interested in reading more about the individual men, you can pick up “Helmet For My Pillow,” written by Leckie, and “With The Old Breed,” written by Sledge. Right now I’m reading “Guadalcanal Diary,” by embedded journalist Richard Tregaskis. There’s plenty of good reading material out there. Books or Comics or Both? While I’ve always been into comic book characters and movies, I’ve never actually been into comics themselves. I’ve seen every X-Men, Spider-Man and Batman movie, but I’ve never read their comics. I admit that, as someone who considers herself well-read and extremely literate, I’ve never had too high an opinion of comics. Unfortunately and, yes, unfairly, my perception of comic fans has long resembled Comic Book Guy on The Simpsons. You know — extremely knowledgable of the material, but socially awkward and so fanatical about keeping the comics in “mint condition” that he doesn’t even read them anymore. Despite my reluctance to start collecting, I’ve found a happy medium between reading books and skimming comics. I’ve finally discovered the graphic novel. My introduction graphic novels, I think, couldn’t have been a stronger choice. Of course I started with Alan Moore’s “Watchmen.” I knew Moore as the writer of “V For Vendetta” and as an Englishman who looks like Jesus mixed with Charles Manson. I read “Watchmen” last fall, about five months before the film came out. It, more than anything, took the edge off my comic snobbery. It’s the only graphic novel to make “Time” magazine’s top 100 modern novels, and features characters and moral dilemmas fit for any “serious” novel. “Maus,” like “Watchmen,” appears to turn a graphic novel into high art. Spiegelman won the Pulitzer in 1992. More a memoir than a novel, it tells the story of Spiegelman’s parents during the Holocaust. The Jews are mice, and the Nazis are cats. I haven’t cracked it open yet, but I envision another great reading experience. So if you’re hesitant to pick up a graphic novel for whatever reason, give it a try. I’m slowly building up a nice collection. What I will never get into, I promise, is manga. Two weeks ago, I visited Little Rock, Ark., with my parents. The day after visiting Bill Clinton’s presidential library, we drove to a more suburban part of the city to see Little Rock Central High School and the accompanying little museum. 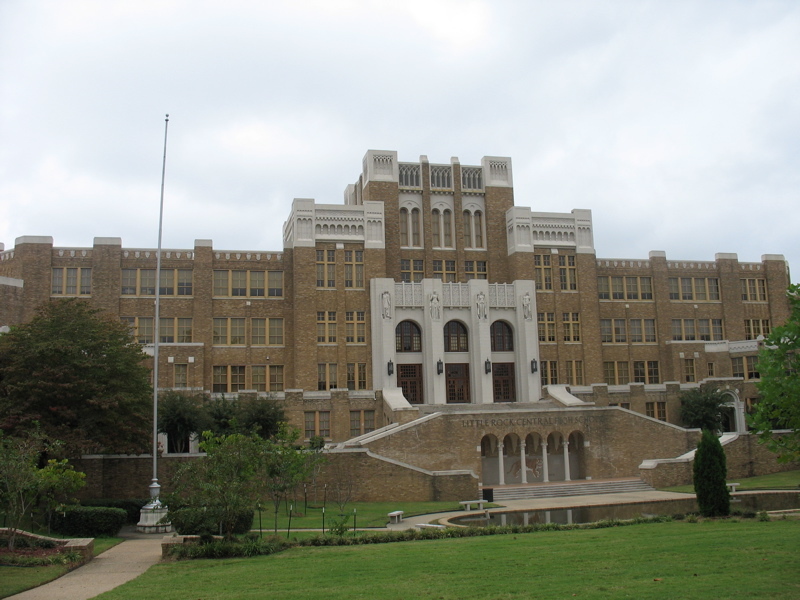 Little Rock Central High School. After Brown v. Board of Education in 1954, integration began in the nation’s schools. In 1957, nine African-American students attempted to attend Central High. Protests, threats and harassment were rampant, and Gov. Orval Faubus attempted to keep the students from the school. In the end, President Eisenhower had to call in the 101st Airborne to protect the students, while federalizing the state’s National Guard. The museum had the displays you’d expect. A history of discrimination, photos and audio of protests and sit-ins. Video of news broadcasts and press conferences. It was a display in the middle of the museum, however, that caught my attention. This display was simply called “The Press.” It displayed headlines and front pages from the Little Rock crisis, and explained how in many cases, throngs of reporters and photographers took the brunt of protesters’ anger, acting as a buffer for the nine students. I just started reading a book, “The Race Beat,” by Gene Roberts and Hank Klibanoff. I found it in the site’s museum. It’s a fascinating story about journalists’ role in the civil rights movement. In many cases, it’s not that these journalists “took sides.” It’s that they bothered to cover the movement and the inequality at all. It’s that they allowed civil rights leaders the opportunity to present their cases. The cause also showed up in staff editorials, when progressive editors, both black and white, called for change. It’s a powerful reminder of a free press’s necessary role in a democracy. One can’t exist without the other. Reading about this time period reminds me of lessons I learned while in school. Journalists don’t exist in a vacuum. We’re not mindless automans, reading the weather and sports agate like robots. I also learned that while we should always strive for fair coverage, we should never think that fair automatically means equal. Or that equal automatically means fair.